The greatest degree of inner tranquility comes from the development of love and compassion.The more we care for the happiness of others, the greater our own sense of well-being becomes. Cultivating a close, warm-hearted feeling for others automatically puts the mind at ease. This helps remove whatever fears or insecurities we may have and gives us the strength to cope with any obstacles we encounter. It is the ultimate source of success in life. 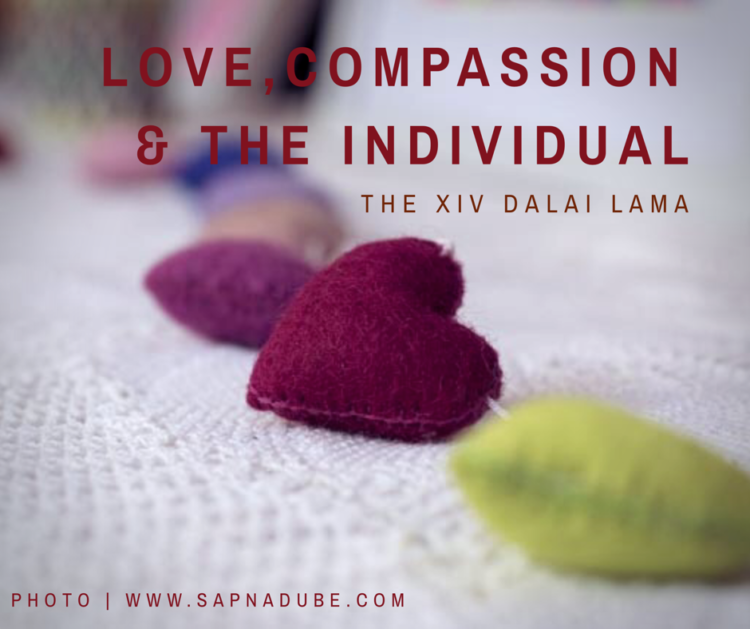 Ultimately, the reason why love and compassion bring the greatest happiness is simply that our nature cherishes them above all else. The need for love lies at the very foundation of human existence. It results from the profound interdependence we all share with one another. However capable and skillful an individual may be, left alone, he will not survive. However vigorous and independent one may feel during the most prosperous periods of life, when one is sick or very young or very old, one must depend on the support of others. Inter-dependence, of course, is a fundamental law of nature. Not only higher forms of life but also many of the smallest insects are social beings who, without any religion, law or education, survive by mutual cooperation based on an innate recognition of their interconnectedness. It is because our own human existence is so dependent on the help of others that our need for love lies at the very foundation of our existence.